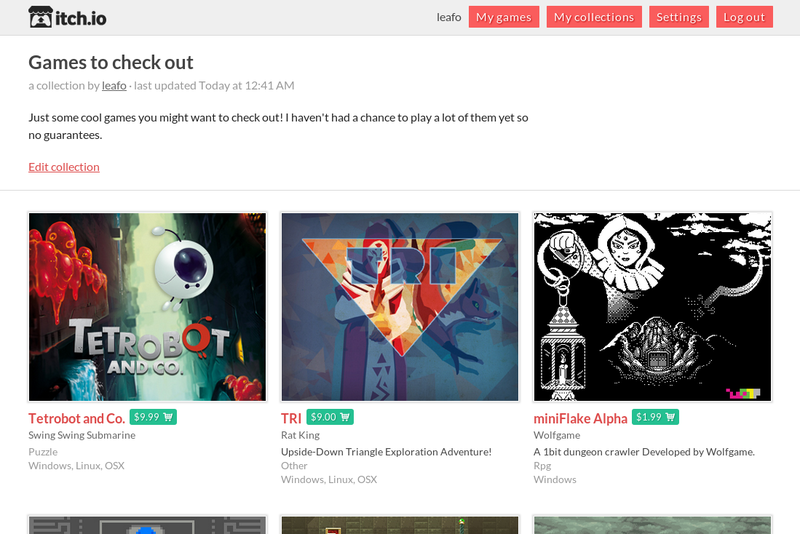 A few months ago itch.io got the ability to create collections of games and share them on your profile. Today collections are getting a slight upgrade. Just click on the title of a collection anywhere where collections are shown to be taken to the collection’s page. Because there are two ways to view collections now (either on a user profile, or through their new dedicated pages), a new option has been added. You can now mark a collection as private. Private collections can only be seen by their owners. Lastly, you can now add a description to your collection that will get displayed on the dedicated collection page. A great way to describe your thoughts about the games you’ve collected. If you own a collection just go to its page and click the Edit collection link to set everything up.